WHEN ARE TAXES BILLED AND WHEN ARE THEY DUE? Each November, tax bills are sent for the current year. The 1st half payment is due by December 20th. The 2nd half payment is due by June 20th. On December 21st, a late fee of 2% of the first half tax amount is added to the tax bill. (Idaho Code 63-1001). On January 1st, 1% per month interest begins to accrue. (Idaho Code 63-903). On June 21st, a late fee of 2% of the full amount due is added to the tax bill. (Idaho Code 63-1001). On June 21st, 1% per month begins accruing retroactively from January 1st. (Idaho Code 63-903). The amount of tax is determined from the budget needs of the local taxing districts. Many kinds of taxing districts exist in Idaho. Some, like cities and counties, levy taxes to provide a wide range of services. Special bonds or assessments, passed by the voters of the county. EVERY PROPERTY OWNER IS TAXED TO EACH TAXING DISTRICT AT THE SAME RATE; ACCORDING TO THE VALUE AND LOCATION OF THEIR TAXABLE PROPERTY. Yes, most taxing districts have a maximum tax rate that they can charge. Districts other than schools are limited to an annual increase of 3% plus an allowance for growth on a portion of their budget. The growth allowance is calculated from the value of new construction and annexation that occurs during the year. The property type and parcel number are identified on the top right side of the tax bill. If prior year taxes are owed, the deliquent year(s) are shown on the bill. The tax amount listed on the bill reflects only the current year's tax amount due. (For payoff amounts for deliquent taxes, including late fees and interest, please contact the Treasurer's Office at: 208-354-2254). 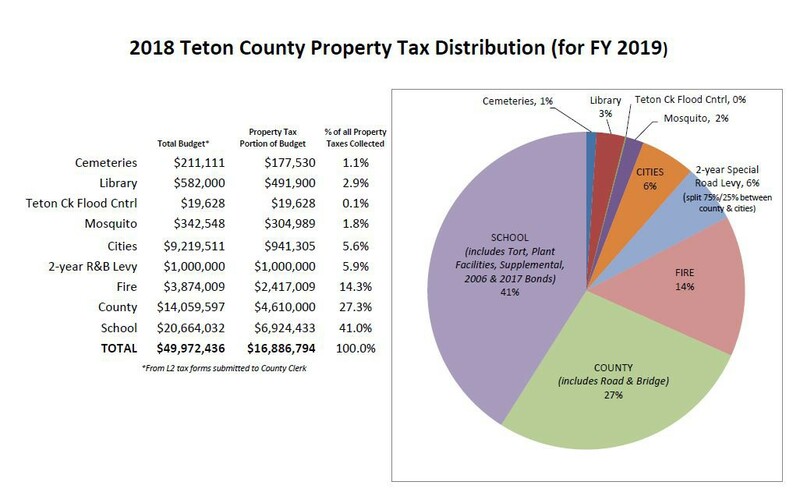 The tax bill also includes a breakdown of the Teton County Taxing District's levy amounts, as well as the legal description of the parcel. Mobile homes are considered personal property and deliquent taxes require additional procedures. Full payment becomes due and payable immediately, including late fees and interest. A Warrant of Distraint process begins. This allows the Sheriff to seize the property and any other personal property, to equal the total assessed taxes, late fees, interest and Warrant of Distraint costs. It is illegal to move, sell or dispose of personal property or a mobile home, without paying all deliquent and/or current property taxes, late fees, interest and costs due. IF MY MORTGAGE COMPANY PAYS MY TAX PAYMENTS, DO I STILL RECEIVE A TAX BILL? Many mortgages are set up to collect extra funds from each mortgage payment, to keep in an escrow account and then distribute payments for property taxes. The mortgage company will receive a copy of your tax bill. However, Idaho Statute requires that property owners also receive a copy of their tax bill. As the property owner and taxpayer, it is your responsibility to ensure that your taxes are paid on time. If you are not sure whether you or mortgage company will pay your taxes, we recommend that you contact your lender before making a payment. It is also the responsibility of the property owner to contact the county if your mailing address changes. 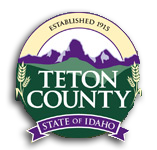 HOW DO I UPDATE MY MAILING ADDRESS WITH TETON COUNTY? Teton County Treasurer's Office staff works hard to ensure that each taxpayer receives a copy of their property tax bill, however, we need your help. If your mailing address changes, please email us to let us know. Physical address of the parcel (if available). CAN I GET FINANCIAL HELP WITH MY TAXES? Property tax relief is available through the Homeowner's Exemption, Hardship Exemption (exceptional situations) and State Circut Breaker Programs. Homeowner's Exemption is available to all property owners on their primary residence. (You only need to apply for this exemption once, unless changes are made to the property deed). Please contact the Teton County Assessor's Office to apply or call 208-354-3507 for more information. The Circut Breaker Program is funded by the State of Idaho as a benefit to taxpayers on a limited income that are 65 or older; or disabled or widowed. Eligibility is determined by income. Applications for this program must be made each year between January 1 and April 15. Please contact the Teton County Assessor's Office for more information at 208-354-3507. Hardship Exemption is available upon application and approval by the Board of County Commissioners at a public hearing. The approval is based on extreme and unusual needs and is typically granted on a one-time basis. Please contact the Board of County Commissioner's Office to apply. HOW ARE EXCESS FUNDS FROM TAX DEED SALES DISTRIBUTED? Idaho Code 31-808 was amended by 2016 Senate Bill 1347a to permit the County, after payment of party of interest claims, to transfer excess proceeds resulting from the sale of a tax-deeded property to the State Treasurer to be claimed and distributed as unclaimed property. The County will no longer hold any excess funds from a tax deed sale.